Athena had been contacting her song for days in his dreams now, trying to tell him to meet her, but he kept resisting. She had to do something in order for him to hear her properly. She closed her eyes and leant on the pillar behind her, and tapped into her powers. 'Dante... Dante, can you hear me?' She focused on reaching him, and then felt a large pang in her heart, making her double over. She was breathing heavily. Her son was in danger. She quickly focused on claiming him, making a bronze helmet appear above his head as a sign of her claim. This would not only make him hers, but give him powers also. 'You can use these powers to help you! Hurry!' She thought to him desperately, panic showing in her voice. 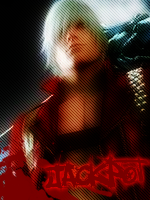 Dante was walking through the outskirts of new york, headed towards a roadhouse. Hoping to find a room, he went to the barkeeper and ordered a room and a pizza with olives. "Take it to my room in an hour" Dante said while trowing the money on the counter. He pulled out his key and walked into his room and trew his coat on a chair. layed down on his bed, and fell asleep in a matter of seconds. Dante... Dante can you hear me? Again he heard the woman speak to him in his head. What was it with this dream, it just wouldnt go away. Suddenly he woke up with a terrible headacke. He heard someone scream downstairs, it was something he heard an awfull lot of times. Quickly he grabbed his guns and walked to the door. He grabbed his coat and trew it over his shoulder and reached for the door. You can use these powers to help you! hurry! He heard the voice yet again, but this time he heard it loud and clear, and he wasnt sleeping. At that moment, a horrible vision passed through his head. "Someone is about to step on .... my pizza"
It was unknown to him how he would know this, but he couldnt waste any time to save his pizza. He grabbed the handle and quickly opened the door, jumping from the stairs onto the counter. Athena was gripping tightly onto the pillar behind her as she saw through her son's eyes. 'Please, be careful, Dante. It's dangerous!' She warned strongly, despite feeling weak and helpless inside. She wished she could go down and help her son, but by the time she would have got there it would be too late. He had to use his powers for himself. For now Athena just prayed and prayed as she watched in suspense, waiting and knowing what was coming next. Standing ontop of the counter, he saw his pizza laying next to him. He was relieved for a second, but he then heard a scream from beside him. men wearing hoods where hammering on a locked door, and it seemed as if the barkeep and his customers locked themselves in to get out of harms way. "And who might you be" Dante said while grabbing one of the hooded men's shoulder. A moment later the man turned around and showed his unhuman face to Dante. Please, be careful, Dante. It's dangerous! The beast started screaming and the others where moaning and speaiking to eachother in a demonic language. then they picked out their dagger's wich where coated in blood and jumped at Dante. When the first one was near Dante, he quickly stepped aside and blasted the man in the skull. While the man erupted in flames, it was clear to Dante that he wasnt fighting human's after all. "Demon's huh. Well what are you waiting for" Dante said mocking the demons. "Lets Dance" he said while the demons jumped him. Kicking the first demons back, he hit the creature with amazing force, slamming it right through the wall. "Now that's what im talking about" Dante thought to himself. The other got a bullet to the head and disapeared in a burst of flames. Slowly opening the door, he walked up to the other demon, grabbed him by his hood and lifted him up. "I guess you picked the wrong time to mess with these people". he then put a gun in its mouth and blasted it's brains out through the back of its skull before it bursted into flames and disapeared aswell. He then walked in and told the barkeep that it was clear. He then started looking for his pizza. Then in a split second, he saw his pizza laying infront of the door wich slowly opened. "Nooo, Dont" he cried out while the man placed its boot on the pizza. "Damnit" Dante said while he put on his coat and walked outside. "Demon's, that was what all that fuss was about. Next time, let me have some sleep"
Athena let out a sigh of relief, as she chuckled lightly in her mind. 'I'm afraid I cannot let you sleep yet. Come to the Empire State building, and come to the top floor. Trust me on this one Dante, you need to come. I have so much to tell you in so little time.' She thought to her son, eager to meet him at long last. She wanted to see what he looked like, how much he had grown. Never had she been so enthralled by the simple fact of meeting someone. But this someone wasn't a normal person. He was her son. Come to the Empire State building, and come to the top floor. Trust me on this one Dante, you need to come. I have so much to tell you in so little time. These where the words the woman said to him half an hour ago at the road house. He had been running for 30 minutes straight, heading straight for the empire state building. Though he himself had no intention of going into new york, he was interested in getting answers as to why he kept getting troubled and why he was constantly chased by demons. The thing he hated most about the city's where how many demon's and other creatures live in the shadow's. He knew that he was being followed all along,but he didnt want to give that away just yet. Before walking through the door, he turned around and shot a volley of bullets through a wall across the shady street. At first it would seem as if he hit nothing, but when dante turned around and walked up the stairs, blood was running through the bulletholes. "Stalker stalked" Dante said grinning. When he got up to the top of the tower, there was nothing to be seen but dark sky. "I kept my end of the bargain!". Athena chuckled, and made the bridge to Mount Olympus stretch down to the Empire State Building. She walked slowly and with purpose across the bridge, coming to a halt at the end of the golden walk-way. "You've grown." She murmured to herself more than anyone and smiled at the boy in front of her. "My name is Athena, Dante, the Goddess of War and Wisdom. I'm sure you want answers as to why I have been contacting you, am I correct?" She paused, and decided to carry on anyway because she could read her son's thoughts. He wanted to know why. "17 years ago, I gave birth to a beautiful child. The father of that child was a mortal, and after I had met him I had to leave. You see, I also had to send down the child to Earth after he was born." She stopped, and looked into the eyes of her son. "My child is you, Dante. I hated to let you go, but it had to be done. Now you have been claimed by me and you have all of my powers." She then stopped speaking, and deciding that Dante would not believe what he was told, she smiled softly at him. "Now, I want you to show me your silver chain. It should have 17 blue beads on it, am I correct?" She asked, waiting for an answer. After a moment of silence, Dante's regular grin appeared on his Face. "I do not know how you knew about my necklace, but my parent's died years ago". Not even impressed a little by the sudden arival of a god, he sat down on the edge of the building. My child is you, Dante. I hated to let you go, but it had to be done. Now you have been claimed by me and you have all of my powers. "Why should i believe you are my mother, or even family ?" he said while showing his necklace. Athena continued to smile, her hand brushing on the same silver chain that was concealed by the top of her dress. She pulled it over her head, and showed Dante the chain. It had many thousands of beads on it, too many to count. "You should believe if because I have proof. This necklace is exactly the same as yours. For every year that you live, a new bead will appear on it. It applies to my necklace also." She held out her necklace to Dante to take. "You can look if you wish. Everything is the same. I am a crafts expert, and most buildings you see around Olympus were my doing. And as my child, you have the power to craft also. Weapons, items, even sky scrapers. You will make them all with complete ease." She stopped, and looked properly at her son. "It's amazing how much you look like your father, Dante. It seems like only yesterday when I had to send you down to earth. But 17 years isn't a long time for Gods." "If you need any more proof, why do you win at games like chess every time, without fail? It is because I have made some of the most efficient battle strategies in my time, and I have passed it down to you. The ability of making a strategy is a gift." She continued and then waited. It's amazing how much you look like your father, Dante. It seems like only yesterday when I had to send you down to earth. But 17 years isn't a long time for Gods. "My father you say, please tell me about him. What was he like, Was he a hunter aswell, did he know anthony. Did you know anthony ?" Dante was suddenly filled with questions and emotions he only had when he was around anthony. "If you are really my mother, then you should know. If you tell me about them, i have no other option but to believe you" he said like making a deal. "And one last question, whats my favorite food"
Athena didn't seemed phased by all the questions fired at her, instead she picked all the separate answers apart. "Your father was a hunter, yes. I met him when I was asked to do a check on the city. Every so often one of the Gods will have to do a check to make sure everything is in order. He was a man of few words, but the words he said he meant. Very handsome and popular with the ladies. At first I thought that he would go for my sister Aphrodite, the Goddess of love. But then he followed me back to the Empire State Building one night." She continued to smile as she avoided the subject of how Dante came to be. She thought he would be able to figure that out. "Yes, you father did know Anthony also, as did I. I helped him for a while, as well as your father before you were born." She chuckled slightly and shook her head. "Anthony insisted that I sat down and took it easy. He obviously didn't know me very well." "I know for a fact that your favourite food is pizza, Dante. The same as your father's. He took me out to an Italian food place while I was in New York, and he ordered the biggest pizza I'd ever seen." She the paused. "Now do you believe me?" She asked. "Hmmm, once again i will keep my end of the bargain, Mom" he said ever so relaxed. he slowly got up and looked at her again. She actually doesn look a little bit like me, atleast we share some hobby's. Slowly he walked up to her and said "Why did you come down for me now, did it have any special reason. Is there something that needs to be taken care off". While walking up to his mother, he felt two emotions, one stronger then the other. One was definetly his newly formed conection to his mother, but there was something else, dark, though it felt like it was calling to him. It felt as if part of him was calling him to come closer. The two mingling feelings drew him closer to his mother untill he stood infront of her and hugged her tightly. "I believe you Mother". Athena smiled dreamily and hugged her son tightly, her hand instinctively pressed onto the back of his head gently as she played with his hair. "A Demi-God's powers are called upon in difficult situations." She answered his earlier question. "That is why yours were activated just now." She had forgotten all about the small bottle of which was attached to her belt, and it started to pull and faint demonic laughter could be heard. Athena gasped and let go of her son quickly, but it was too late. The bottle had cracked and smashed open, and the evil essence was snaking it's way over to Dante. "Dante, watch out!" She cried out of desperation and took her spear from her back. She had captured the essence and she would do it once more, hopefully before it was too late. Dante suddenly got pushed off and was then blinded by a red light. "We .. will be one whole". A moment later the light faded and he saw his mother pointing a spear at him. "What's with the spear" Dante said, not noticing his new looks. When he tried to push the spear away, he noticed his arm and startled himself for a second. "What the .." Dante said. After that he started moving around, running up the wall. he then started punching infront of him, feeling how much stronger he had become. "how did this happen mother.. how ..
"Dante, I need you to stand still." Athena said, her eyes mad with panic. Her protective instincts had taken over, and she still held her spear rigidly in her right hand. "That being that has just taken over your body is called a demon. He is one of the most evil one can find. I was sent to slay him, which I did, and since then I kept his essence in a bottle so he could never escape." "Unfortunately, it looks like he has. It's nothing that I can't handle, son, don't worry." She then reassured him and surveyed what was going on. "Wait a minute... Can you control the demon?" She waited for her son's answer, and actions. Dante, I need you to stand still. That being that has just taken over your body is called a demon. He is one of the most evil one can find. I was sent to slay him, which I did, and since then I kept his essence in a bottle so he could never escape. Unfortunately, it looks like he has. It's nothing that I can't handle, son, don't worry. Wait a minute... Can you control the demon? "Mom, i dont think it took over, i think it's actually the other way around. But ill try if i can force it back". He felt something inside of him, it was'nt solid though. It felt somehow like, moving an arm. When he focused on it further, his body started glowing faintly. Followed by a powerfull flash of light, his body somehow turned back to normal. "At first i felt something inside of me, but now it seems like it .... merged with me. Is that even possible". "What do you know about the demon, and about demonic essense's". Athena sighed with relief and put her spear away again, walking over to Dante and placing a hand on his shoulder, smiling at him. "I'm glad. You most definitely are my son." She laughed and answered his other question. "I know quite a lot about demons. I've been called down to the Under World to slay a lot of them. Demonic essences can be dangerous is the person the find their into can't handle them." "Basically what will happen is the person will lose all control and the demon will take over. But now you have control of this demon, I can grant you a power which will allow you to call upon it if you are in grave danger." Athena blinked, and another bronze helmet appeared above Dante's head, like the one when she claimed him. "There." She smiled and hugged her son once more. Then, she pulled away and held him at arms length, her hands holding his shoulders. "Now, you need to go to a place named Camp Half-Blood. It is a place for Demi-Gods to go and train their powers. There are many people there who you will get along with, I'm sure." Now, you need to go to a place named Camp Half-Blood. It is a place for Demi-Gods to go and train their powers. There are many people there who you will get along with, I'm sure. "A camp ... youre sending me on a camp". He then turned around and walked at the edge of the building and overlooked the city. "Anywhere is better then here atkeast, even if it's a camp". "But i cant go in this outfit, it's ragged and beaten up. And i do want to make a good impression" he said. "Just think about how the ladies would respond to these beat up clothes, they'll think im a hobo, or a trucker". "Can you do something about it, since you are a god of craft" he said with a devious smirk on his face. Athena laughed and shook her head, rolling her eyes. "Now you definitely remind me of your father. But I'm ahead of you, Dante. Follow me, I've made you something I think you'll like." She said mysteriously and looked at her son before smiling and turning to walk through the pillars of Mount Olympus. "My house is right at the back, but it won't take us long." She called back over her shoulder and continued to walk at a slow and steady pace so that Dante could catch up. Now you definitely remind me of your father. But I'm ahead of you, Dante. Follow me, I've made you something I think you'll like. Before he walked after Athena, he spat from the top of the building and watched it disapear below him. He then walked after his mother towards her house, wondering what it was that he was going to get. "What is it you have for me" he said, Is it a trenchcoat, or boots, a new gun, A sword maybe. While slowly walking into the house, he kept on wondering what it would be. Athena lead the way into her front room, where a wooden hanger was hanging from the fireplace. It was covered in a white dust sheet, so the outfit beneath it was concealed. "I made this for you a couple of days ago." She said, going over and unzipping the cover, and letting it fall to the ground. "It is completely invincible. The only people that can destroy it is me, or you." She handed it over to him. "And I think you'll find everything will be a perfect fit." "Another thing I have to give to you, is this metal." She took the chunky strip of metal that was beside the outfit, and held it in her hands. "This is specially made metal up here on Mount Olympus. Because you are my son, you can make weapons of your choice with this with ease." She then handed that over and sat down behind her on the couch to watch Dante's reaction. She hoped he would like the things she had made for him. I made this for you a couple of days ago" his mother said while showing of the sheet covering the clothes. Slowly he walked up to the fireplace and took the clothes inside. since he was allready inside, he figured he could take of his pants and shirt and trow it into the fire. He then quickly changed into a long, red leather trenchcoat, baggy brown pants, leather boots and black gloves. Like his mother said, they all fitted perfectly. But now he was having a problem, what to do with the metal. "How the hell does this work" he thought to himself. Athena smirked slightly and nodded her head. "Fair enough. I'll start off the handle, that's the hardest thing on a sword to make." She took the metal gently and picked the farthest end of it, bending it over and over in many quick movements. Soon enough, the handle was twisted and gleaming, with a small ball at the top of it. Athena shaped off the other semi-handles on the sword, and handed it back to Dante. "There. You can bend any metal just like I can. Give it a try." She smiled kindly at him, being patient and sweet which was very unlike herself. Seeing as how Athena did it with such ease, he chose to give it a try. closing his eyes and imagining a sword that would fit him. He started bending the steel as if his hands where doing it by themselves. A few minutes later, a large and heavy sword lay in his hands. It had a skull and ribs above the handle, and out of the skull came a long, razorsharp blade. "Awesome" Dante said while picking up the sword and slashing it around, forgetting he was inside someone's house. cutting through a vase and a table, he turned his head and smiled to his mother, as if he was apologizing. "I think im ready to go now. After all, i am the son of a god and a demon hunter". he then looked at himself in the mirror, seeing the his other demon self flash by for a second. "I am no longer human, i am now truly a halfblood. Both divine and unholy blood flows through me now" he said both sad and at ease. "But if there is one thing i have learned from anthony, it is that power doesnt make a man a man, it's how he uses it. And i think i understand why the demon's essence fused with me now. Though the demon no longer exists, it is now a part of my strength". He then turned to the door and said "Take me there please, Athena". Athena stood up and smiled at Dante, ignoring the sliced vase and table. She could make new ones easily. "Of course." She lead the way out of her house, and she stopped in the doorway, turning back to her son. "I just want you to remember one thing." She said slowly, before looking into Dante's eyes. "I will always be there for you if you need me, my son, and I will always, always be proud of you." She said, her eyes showing the truth behind each and every word. "Now, I shall take you personally to Camp-Half Blood." She walked out of her house and waited for Dante to follow.